The threat, an innovative, potentially devastating form of computer virus, has Microsoft and anti-virus corporations scrambling to develop protection, with consumers and businesses strongly advised to disable all systems running Microsoft Vista until a sanctioned antidote has been found. The virus, code-named "Vista Dysentery.Net-Worm" is believed to be the first computer virus that is fully organic in nature. Because of this dramatic departure from traditional computer virus construction, the Vista Dysentery.Net-Worm virus cannot be targeted by standard anti-virus software. "It's a quantum leap, if you will, in computer virus development, and probably the most dangerous new worm we've ever seen," Darryl Sickle, a security specialist with McAfee Associates, said. "This virus is a biological entity, rather than a sequence of computer code. That's a threat category we've never even considered, and at the moment Windows Vista users worldwide are completely defenseless." 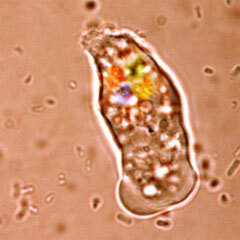 According to Mr. Sickle and others who have studied the virus, Vista Dysentery.Net-Worm mimics, in some ways, the actions of the amoeba known as Entamoeba histolytica, which causes Amoebic Dysentery in humans. "As such, virus is probably the wrong characterization," Mr. Sickle said. "This is more like a bacterial infection of your computer." Based on studies conducted at the Early Warning Antivirus Center in Bolton, Wyoming, Vista Dysentery.Net-Worm is caused by an amoeba-like organic entity that is capable of transmitting itself at rates approaching the speed of light across fiber optic and copper network cables. The virus, which is believed to have been genetically engineered, carries a sophisticated sensory mechanism built into its DNA that allows it to pinpoint and target Windows Vista computers via magnetic resonance analysis of the hard drive stack. Because the virus is not dependent on a machine being activated, it can target machines even when they are turned off. The only requirement is that the computer have at least one copy of Microsoft Windows Vista installed, and that it be physically connected to the internet or an infected LAN. As yet, the virus is not believed to be capable of transmitting itself across wireless networks. Upon arriving at a suitable host machine, Vista Dysentery.Net-Worm begins replicating itself at the rate of roughly one division per microsecond. Within minutes, trillions of new, fully-activated viral entities are ready to be dispatched back out across the same broadband networks, where they immediately begin seeking out other vulnerable Microsoft Windows Vista hosts. A subset of Vista Dysentery.Net-Worm "amoebas" remain on the host machine and rapidly consume the hard drive, flash and USB memory modules, RAM, and other sensitive internal components, excreting residue in the form of a gray, pulpy mass. "Most users won't even know they've been infected until they notice that their computer is sitting in a pool of viscous gray sludge – sludge that used to be their hard drives," Mr. Sickle said. Grass roots remedies, such as applying aspirin or Vicks Vapo-Rub to the outer surface of the computer, Mr. Sickle said, are believed to be ineffective. Until a working "antibody" for the Vista Dysentery.Net-Worm virus is developed, Mr. Sickle recommends all Windows Vista users immediately power down and physically isolate their computers, ideally, if weather conditions are suitable, by burying the computer in at least three feet of snow. "We think cold weather can help slow the replication rate of the virus," Mr. Sickle said, "but that's only a stopgap measure. If your computer is infected, your only hope is a secure backup, because whatever's inside that box is going to be goo within no more than a few hours."